The premier modern d20 martial arts sourcebook is back in print. Blood and Fists: Master Edition is a reprinting of the original critically acclaimed supplement plus additional material previously only available in PDF. This new supplement contains over 100 real world martial arts styles and maneuvers as well as science fiction styles for space and post-apocalyptic settings. 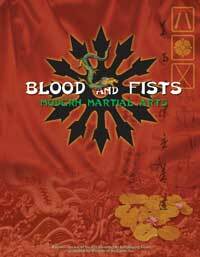 From Aikido to Zen, Blood and Fists: Master Edition has it! The d20 Modern Roleplaying Game handles martial arts well enough for games that focus on gunplay, driving, criminal shenanigans, getting your brain eaten by zombies, and all that other fun stuff, but in these games, combat with weapons is a preference, and a skill in unarmed combat is developed as a fallback position in case you are disarmed. Many people, however, enjoy watching movies with Bruce Lee, Jackie Chan, Jean-Claude van Damme, and others that feature a decided focus on unarmed combat. Blood and Fists allows you to bring these kinds of combat situations into your d20 Modern game. In addition to two-fisted, two-footed action scenes, Blood and Fists also gives you new rules for the more mystical side of the martial arts, abilities like Ki and Zen.